I taste black tea, sweet tangerine juice, and the oh so slight bitter of grapefruit slowly melting into a wine note with a tiny bit of tannin. Finishing with creamy honey and tangerine notes again as the chocolate notes slowly get stronger and linger for quite a long time. Slow down, relax, and taste chocolate. I tasted this bar several times over about a week. When I was in a rush and a bit unfocsued I completely missed the tangerine notes, perhaps my favorite discovery in this bar. 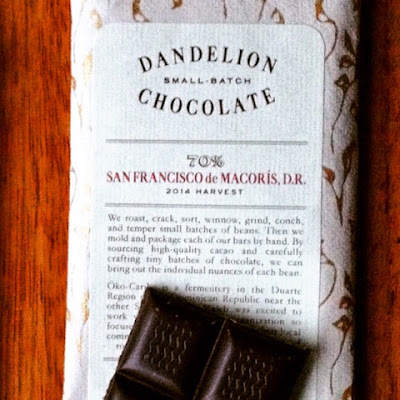 Dandelion Chocolate is a craft chocolate maker in the Mission District of San Francisco, CA making chocolate with only two ingredients cacao and sugar. At their unique factory and cafe you can attend classes, tours, and events as well as watch their chocolate making process live in action as you sip a beverage and munch on chocolate pastries and treats.